ECOT founder Bill Lager at a Statehouse rally for ECOT in 2017. First, the benefits that we know about to Lager and ECOT. As mentioned from 2001-2016, Lager’s Electronic Classroom of Tomorrow received more than $1 billion from Ohio taxpayers. $170 million of this money went to Lager’s other companies (Altair Management and IQ Innovations) to run day-to-day operations and provide software to ECOT. 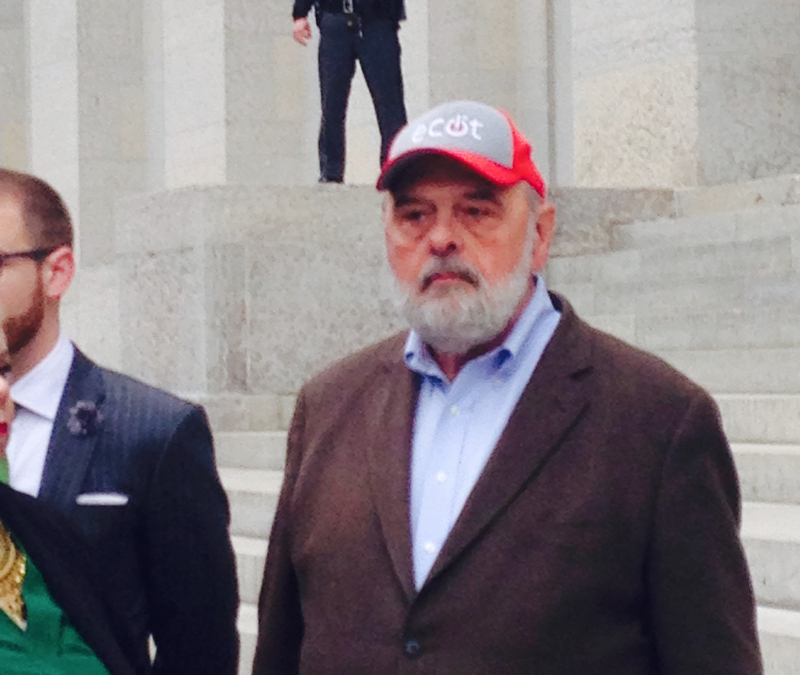 Facing public pressure on ECOT, Lager funneled $250,000 of public funds into television commercials to attack the Ohio Department of Education through Third Wave Communications, a company run by his daughter that provided communication services to ECOT. Here’s one of the advertisements paid for with taxpayer funds that ECOT used to try to lobby the Ohio Department of Education. Donations from William Lager to Ohio politicians from 2000-2014. Lager also allegedly gave money to employees to make donations to politicians. The Ohio Republican Party recently returned a $36,000 donation from Melissa Vasil, director of operations at ECOT. Here’s Dave Yost, Ohio state auditor, speaking at the 2014 ECOT graduation ceremony. Guess his opinion changed when he figured out Ohio was being overbilled for students who weren’t actually attending ECOT. Students in online charters lost an average of about 72 days of learning in reading. The average student in an online charter had lower reading scores than students in traditional schools everywhere except Wisconsin and Georgia, and had lower math scores everywhere except in Illinois, Michigan and Wisconsin. Students in online charters lost 180 days of learning in math during the course of a 180-day school year. More ECOT students either leave or fail to finish high school within four years than at any other school in the nation. The last reported graduation rate within four years was 40.3 percent. ECOT usually gets what ECOT wants. But it’s become very difficult to ignore its poor performance. The idea we’ve all heard is that the “market” would somehow regulate itself. This idea comes from corporate special interests that want to privatize government for profit. The problem with this thinking is that the primary purpose of charter schools is noteducation. The primary purpose of these companies is to return profit to owners and shareholders. This creates a conflict of interest where these companies try to figure out the cheapest way possible to achieve some goal, usually test scores. In some cases this is tampering with test scores, in other cases it’s simply getting rid of potentially low-scoring students. Incentives do matter. In the case of charter schools like ECOT, there’s no incentive to actually provide an education to students, especially if you can purchase enough politicians. This isn’t a first for Ohio either. We’ve gone through similar scandals with corrupt charter school operators like White Hat Management and Horizon Science Academy. And it’s not just the operators either. We’ve seen corruption in the Ohio Department of Education with a director of school choice resigning after altering evaluations for charter school operators. Now that you have the story, I’d like to ask you to do two things. First, share the ECOT story with the people you know. I don’t believe the ECOT scandal has received nearly the media attention it deserves in Ohio, especially in terms of the overall culture and beliefs of the politicians at the top who’ve created this mess. Second, contact your state representative and/or state senator and ask them where they stand on charter schools, especially online charter schools. If your representative or senator took money from ECOT, ask them what ECOT wanted in return. Also ask them why Andrew Brenner is still chair of the House Education Committee. Third, elect politicians who believe in education over corporate special interests. The problem isn’t just these charter operators and it isn’t just the Ohio Department of Education. It starts at the top with the people in charge. What we want are politicians who prioritize education over corporate special interests. This November, use education as a litmus test for politicians because these are the people in charge. As long as you still have the corrupt culture in place, White Hat will just be replaced by Horizon Science Academy which will be replaced by ECOT ad infinitum. The Ohio Department of Education (DOE) will throw the charter school operators under the bus and the charter operators will blame the DOE, using publicly funded commercials if they have to, and nothing will change. Investigate your state representatives and senators and elect politicians who believe in education and a strong investment in education this Fall.